This utility places the selection as it looks on the screen as a bitmap-image on the clipboard. You can then paste the picture into a program such as for example MS Word or a photo-editor. 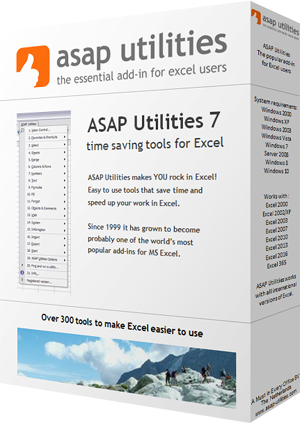 You can also do this in Excel itself but the advantage of having it in ASAP Utilities is that it takes less steps and you can assign a shortcut to it. Excel 2003/2002/XP/2000: Hold down the Shift key and click in the menu on "Edit". Then choose "Copy Picture..." and choose the options "As shown on screen" and "Bitmap". Excel 2019/2016/2013/2010/2007: Select the Home-tab in the ribbon. Then choose "Paste" > "As Picture" > "Copy as picture..." and choose the options "As shown on screen" and "Bitmap". « Return to the list of “Export” tools.